A rogue scientist who's collecting Relics, powerful Lost Logia, for his ambitions. 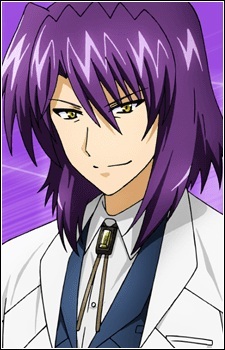 He's had numerous encounters with Nanoha and Fate in the past and is especially at odds with Fate. Scaglietti is interested in Project F, which may be related to Project FATE. Scaglietti has created the Gadget Drones, robots made to disrupt magic with their AMFs (Anti Magi-link Fields) and retrieve Relics for him, and the Numbers, female battle cyborgs named after Italian numbers and armed with artificial magic abilities called Inherent Skills, or ISes for short. The first and eldest of the numbers, Uno, serves as his assistant. Scaglietti appears to be working for a client, who is later revealed to be the TSAB High Council. He is named for the Ferrari 612 Scaglietti, from Carrozzeria Scaglietti.